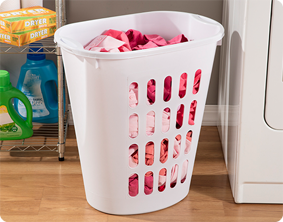 The Open Laundry Hamper combines the size of a hamper with the convenience of a laundry basket. It offers a wide opening for easy placement or removal of clothing. The hamper provides a contemporary shape and a slim profile to efficiently use valuable floor space in the home. The holes provide ventilation for the clothes inside and the integrated handles allow for easy lifting and transporting of items to and from the laundry room. This hamper is an ideal solution for apartments, houses and dorm rooms. When not in use, the laundry hampers stack neatly and nest together creating more efficient storage space in your home. 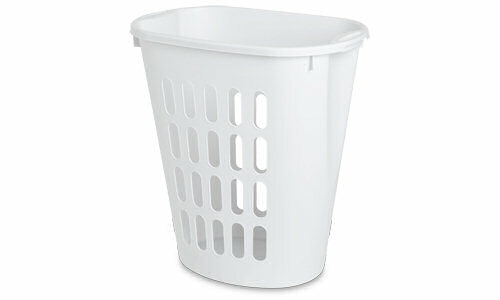 The overall dimensions of this item are 21" L x 14 3/8" W x 21 7/8" H.
Open Laundry Hamper is rated 3.0 out of 5 by 4. Rated 1 out of 5 by mbrown877 from garbage I bought this at the local Dollar General store, for about $8. I guess I should have known better...but I do now! 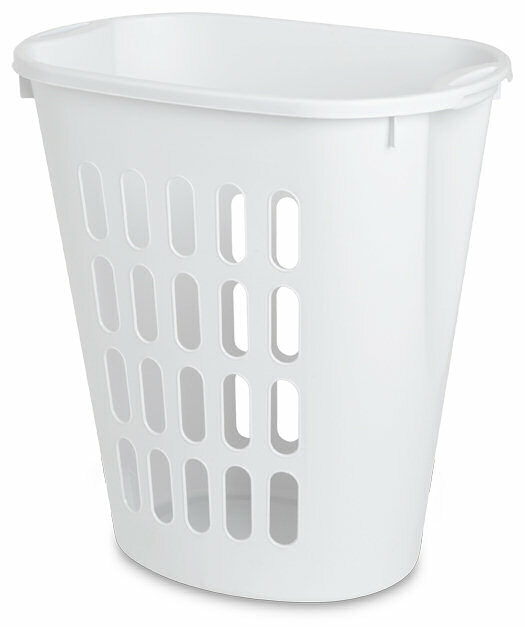 The plastic "feels" thick and durable, but if you fill this basket to the top with laundry a few times, and have to carry it very far (for example, from my 3rd floor apartment, to my car, and then from my car into the coin-op laundry location), this basket cannot handle the load, and begins to crack around the edges. See all 3 pics. My Sterilite basket just cracked for the 3rd time, today, while I was carrying it up to my apartment. I'm looking to buy a more durable brand. Rated 1 out of 5 by Focused1234 from Awful laundry basket I didn't have this basket for a month when it cracked and broke. I'm very disappointed! Rated 5 out of 5 by dontdwell311 from Works great and lasts I bought this around 3 years ago for my boys to use as their dirty clothes hamper. They are extremely rough on this and use it more to play with then actually storing dirty clothes. It is still in pretty much perfect shape. It has not cracked, split or broken, even with the rough treatment. It can hold lots of clothes and is very light weight so i'ts easy to work with on laundry days. Rated 5 out of 5 by Savymommy from I love them I love these hampers I have them in if fervent colors and I always buy them when they go on sale I have five children so I am always doing laundry .there is always baskets of clothes around.